I have never purchased full curriculum... to pricey. Also, I like to think I can do it all. However, as my kids get older and we step farther into our calling as missionaries, I have begun to wish and pray for a good curriculum where all I have to do is review the lessons (prepare), present the material (teach), and help with work and questions (tutor). But still... it is pricey! Enter a wonderful couple from church. They homeschooled both of their sons with the full A Beka curriculum. Both children are now full grown men with jobs and one of them got married this summer... they approached me after church one day and asked if I wanted it! ENTIRE textbook sets for all subjects from 9th through 12th with some text books from 7th and 8th . I was speechless. Why am I taking time to brag on this company and the way in which God used a couple from church to bless me? Because the blessings keep coming. Today, Ashley and I were going through the chapter on the human body. At one point I felt like I had transitioned from a middle school text book to a cozy room in a church bible study! When a SCIENCE text book tells you, "but Science and Physics can't explain the spirit and the soul", when it goes on to quote 2 Corinthians and ask you to compare and contrast Paul's words regarding the church and the body... you know you have found a gem! 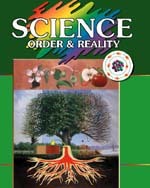 I know there are other great, biblically based science textbooks out there. But I had to share how my spirit was blessed today by this one! May you revel in simple blessings of astonishing truths today!